by Betty Alexandra Toole, Ed.D. "The Analytical Engine has no pretensions whatever to originate anything. It can do whatever we know how to order it to perform. It can follow analysis; but it has no power of anticipating any analytical relations or truths." Also available at Borders, borders.online, bn.online, and fatbrain.com. In the UK, order from the Newstead Abbey Book Shop, 0115 915 3940 voice, 01159153941 fax. "Supposing, for instance, that the fundamental relations of pitched sounds in the science of harmony and of musical composition were susceptible of such expression and adaptations, the engine might compose elaborate and scientific pieces of music of any degree of complexity or extent." *Though the footnotes are not included in the e-book edition, Appendix I has extensive information for people who want to know more about the subject. "We may say most aptly that the Analytical Engine weaves algebraical patterns just as the Jacquard-loom weaves flowers and leaves." 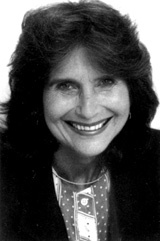 Dr. Betty Alexandra Toole received both her undergraduate and graduate degrees from the University of California at Berkeley. 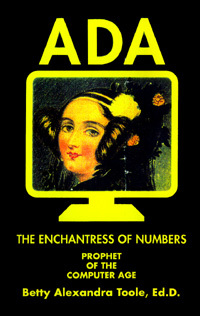 In addition to her two previous editions of Ada, the Enchantress of Numbers, she has written extensively about Ada for many publications: The Byron Journal, Scientific American, Annals of the History of Computing, Happy Mutant Handbook, as well as many Internet sites. She loves being with her family, playing SCRABBLE®, Greek dancing, collecting kaleidoscopes, and traveling. E.E. Kim and B. 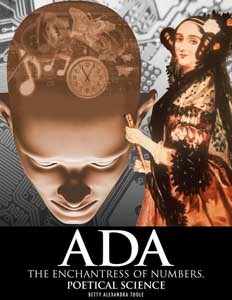 A. Toole, "Ada and the First Computer," Scientific American, May, 1999 (Vol. 280 No. 5), pp. 66-71. (translated into German in Spectrum, July 1999; translated into French in Pour La Science, July 1999). B.A. Toole, "Ada Byron, Lady Lovelace, An Analyst and Metaphysician," IEEE Annals of the History of Computing, Fall 1996 (Vol. 18, No. 3), pp. 4-12. B.A. 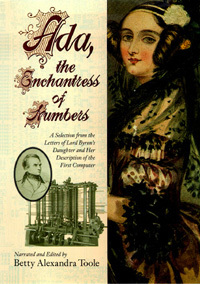 Toole, "Lady Lovelace, The Enchantress of Numbers", in The Happy Mutant Handbook, M. Frauenfelder, C. Sinclair, G. Branwyn, and W. Kreth, Eds., New York: Riverhead Books, 1995. B.A. Toole, "Poetical Science," Byron Journal, 1987.